Coloring pages have never been so much fun! Mandala is a Sanskrit word meaning "circle" and was originally used to refer to religious art in the Hindu and Buddhist traditions. 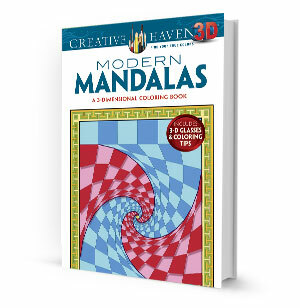 Today, the timeless mandala is seen in all kinds of art, thus making it an ideal choice for Dover's Creative Haven coloring series. Includes 31 elegant mandala designs. Circular illustrations of spider webs, peacock feathers, and other patterns. 3-D glasses and coloring direction are included.